And the red- brownish one in the second photo? Let's just wait and see how many people really go mushroom picking. Nice specimens by the way, when I was a kid gołąbki z blachy with a pinch of salt were a real treat. Did you teach your kids about mushrooms or did you leave that job for grandpa? when I was a kid gołąbki z blachy with a pinch of salt were a real treat. Did you teach your kids about mushrooms or did you leave that job for grandpa? First, I taught myself about mushrooms as a young man, and taught my kids later on. PS. What can you say about the next two photos? It means you destroy great mushrooms by mixing them into a tartar sauce??? edit: no the creamy stuff are not champignons - some kind of borowik? Prawdziwki (porcini) or sowy, no? Yes, nobody does, that is why there is more for me and my family. :):):) After drying, we add them as spice to dishes, if that may help you. The brownish/black ones are kominki! They might be called differently in other parts of Poland though. Great as pierogi/naleśniki stuffing (boil them, fry with onions, add salt and pepper and mince). My father used to pick them. The creamy ones though, I see them often but never picked them, are they good for eating? The brownish/black ones are kominki! They might be called differently in other parts of Poland though. Yes! We call them by their species name - lejkowiec dęty - Funnel Mushroom. Other local names are black boots. Great as pierogi/naleśniki stuffing (boil them, fry with onions, add salt and pepper and mince). That's my project for this summer. My closest friend is a professional mushroom picker, meaning he goes out every day during the season and picks them them to sell. Jagody too. He can spot shrooms which look quite dangerous but fetch a really good price. He also knows where to find plenty of kania mushrooms - really nice breaded and fried. He can spot shrooms which look quite dangerous but fetch a really good price. He probably means the maggoty mushrooms. Those sellers keep good shrooms for themselves and sell wormy ones, especially dried. You have to be careful. 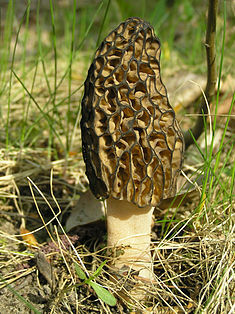 But the Polish, wild mushrooms are the best, and I have tried several, and they are best. You’ll find it a hard work as they grow very low to the ground unlike the American verity that grow on bushes that are as tall as gooseberry bushes but much more tastier. The wild raspberries and blackberries are excellent too, so if they grow in your parts and you have a chance to go, don’t miss it. Those are plentiful, don’t really have to have a special spot, they are tasty and being outdoors all day does wonders for your taste buds. I think it began because of the revoulting smell in the kitchen when my mum fried mushrooms. What? You find that the olfactory system doesn’t work as good in your old age or was it the variety that was common in Britain that did not have a particularly pleasant aroma or is it simply you’re not as picky anymore? There’s nothing like a taste of home grown tomatoes. As I recall your GF has a dacha outside of Moscow you’ll do plenty of mushroom hunting there as the Russians love their mushrooms too. If you have not done a lot of mushroom picking in Poland I suspect you'll do a lot of it there. What? You find that the olfactory system doesn’t work as good in your old age or was it the variety that was common in Britain that did not have a particularly pleasant aroma or is it simply you’re not as picky anymore? This guy sells as much as he can (an elderly family member has a pitch outside a supermarket in warsaw) and bottles the rest He considers it a good day if all the previous day's pick (from 5am to late afternoon) is sold out by the end of the following day. The wild raspberries and blackberries are excellent too, so if they grow in your parts and you have a chance to go, don’t miss it. I've asked him why he doesn't pick those and always got a noncommital answer. They're lovely. When I've been with him near Wyszkow I've mostly found prawdziwki and maslaki, but sometimes he comes back with a few kanie. To be honest, I'm wary of going too often for fear of slowing him down. It's a big part of his income. Great exercise though, and he's as fit as a butcher's dog. Occasionally he finds some pretty dramatic looking ones (I don't remember the name) that sell for a fortune as soon as the stare ropuchy (his words) see them on the stall. Yes, it is, but mine smells better. In medieval Europe, pickled young shoots and leaves of this herb used to be a basis for a sour soup, called "barszcz" in Polish. So historically "barszcz" was green, not red. Young shoots are used today as an ingredient in salads and cooked like spinach. Brew of the herb resembles broth in flavor. Socrates, after being sentenced to death, voluntarily drank the hemlock in prison, in company of friends. Literary tradition speaks of drinking the water hemlock, but the symptoms are indicative of the the reaction to the poison hemlock. Wow, I know this smelly weed. Often wondered if it can be used in kitchen because it bears a striking similarity to dill. So historically "barszcz" was green, not red. , derived from the Polish name szczaw for sorrel. Due to its commonness as a soup in Eastern European cuisines, it is often called "green borscht", as a cousin of the standard, reddish-purple borscht soup. Półgęsek, goose breast, "half-goose thingie"
It was a popular dish in traditional Polish cuisine. It is prepared from deboned goose breast. The skin is first marinated in herbs and spices. The meat plus skin are then either baked or smoked first, then baked. This used to be treated as a rather luxurious dish, usually eaten in manors. It can be served warm, straight from the oven, or served cold thinly sliced. It can be accompanied by various sauces, such as cranberry sauce; raspberry dressing with Hungarian Tokaji and roasted almonds; creamy horseradish sauce - mixed with grated almonds and other ingredients, etc. 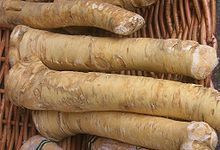 By the way, horseradish sauce used to be called by the French in the nineteenth century, "the Polish mustard." It was a popular dish in traditional Polish cuisine. I call it Polish tabasco. Why are you presenting leaves? Someone may wrongly think they are the main ingredient of "Polish mustard." 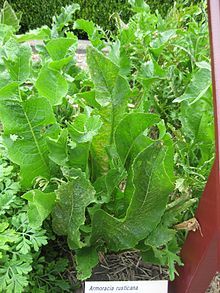 Because it occurred to me that most people have no clue how the foliage of horseradish plant looks like. If my childhood memory does not play any tricks the horseradish leaves were much longer than those shown on the picture - 50 cm, or so. But OK, here are the roots of horseradish plant. Before the days of the modern mechanical kitchen gadgets grating the roots was a job for men (or boys) - quite a physical exercise, with plenty of tears flowing. Actually the picture of "półgęsek" was taken from a web page of some food shipping company in Poland. Easy to find via google - just type "półgęsek". All customer comments I saw on that page were very positive (five stars), although one customer was not happy about the price rising from 66 zł/kg to 92zł/kg. Apparently this was typical supply and demand issue before Easter, and the company was hoping that their costs - as well as prices - would go down after Easter. This isn't what most of us eat..
We throw away the heads, and eat the rest. What do you think about poultry? 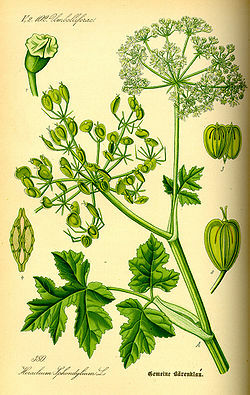 Them Japanese call it "Western wasabi" since wasabi is in fact Japanese horseradish.